Another simple recipe using millets. Puttu, a simple and easy evening snack. Since it is steamed it is healthy too. 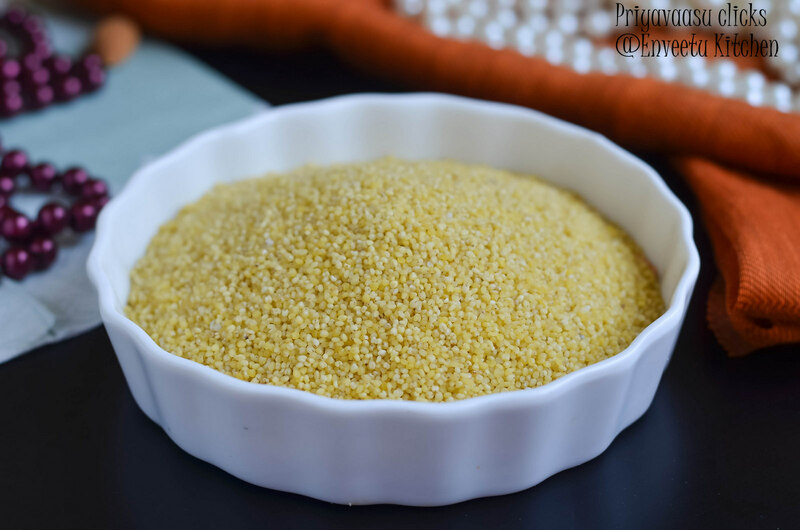 Today i m bringing you Thinai/Foxtail Millet Puttu. Thinai is considred apt for making sweet dishes, since it naturally has a sweet taste. The only additional task is to roast the millet and powder it, i hope you wont mind doing that extra step for the health quotient. Take the thinai arisi/திணை அரிசி in a pan and dry roast it in a slow flame. It will flower up well and become crisp. Take care of the flame, keep it medium and keep stirring. Do not burn the millet, it will spoil the taste. Add salt to the water, mix well and keep it aside. Once it is roasted,transfer it to a flat plate, let it cool for sometime. Take this in to the small mixer mate jar and grind it to a fine powder. Roasted millet will end up into a fine powder, so the key is to dry roast it well. Once powdered, transfer it to a flat plate, sprinkle the salted water onto the powdered thinai/foxtail millet powder. Do not sprinkle all the water just 2/3 sprinkles that's it. Now start mixing the sprinkled water and the powdered millet together, you should be able to hold the flour in your fist and when pressed, it should hold shape and when crumbled it should crumble well. Add jaggery and fresh coconut, mix well. Take two small bowls/silicon moulds or a flat earthen ware will also do good. 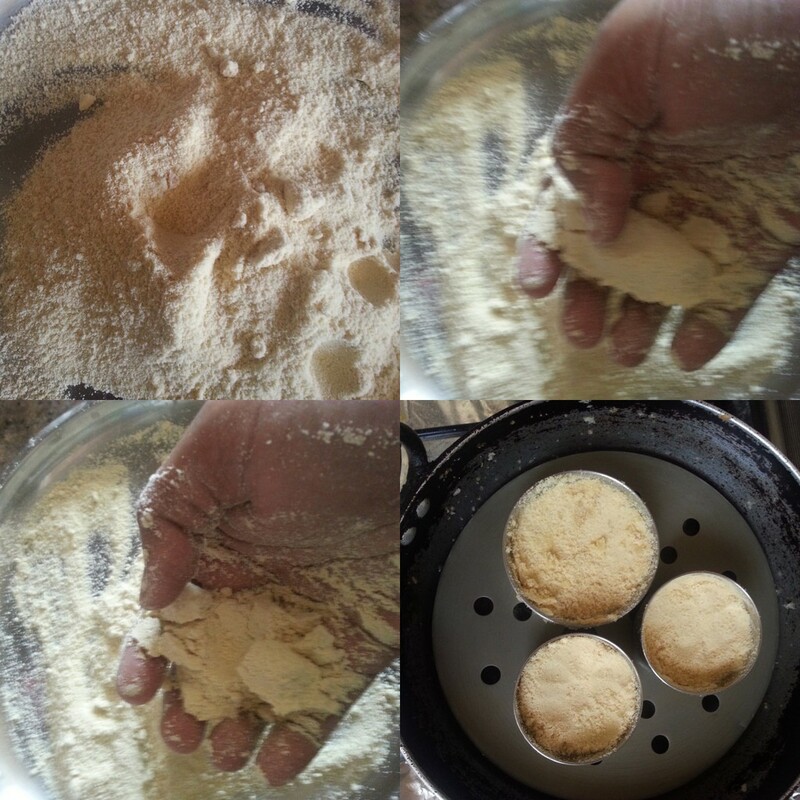 I used three steel katori's/bowl, grease the bowls, fill the bowls with the millet flour mixture. I filled till half their capacity. Cover the bowls with a piece of parchment paper, to avoid water dripping into the bowl while steaming. Steam cook for 8-10 minutes. Remove from the steamer, let it cool for 2 minutes, the carefully unmould it on to a serving plate. Add toasted nuts & raisins. Serve Warm. Wow such beautiful pictures and very healthy dish..I wish my kids eat such dishes as well! wow such an healthy and delicious puttu :) looks so yummy and lovely presentation dear !! nice variation to puttu. looks very nice..
Looks a lot like semolina when cooked. Wow, love your clicks Priya. That deformity is a great snack for a game of scrabble. Hey love the scrabble setting there! Very interesting puttu!